SATELLITE BAND SLOPE CONTROL: from 0 to 8 dB, 1 dB step. SINGLE TRANSPONDER FLATNESS: 0,25 dB at 40 MHz B.W., 0,5 dB at 80 MHz B.W. OPTICAL RECEIVER (opt. ): High sensitivity, with Optical AGC, Very compact, 12 Vdc PSU, 90 dBμV SAT output. USB: 1 port for each Block, for easy Input/Transponder Selections and SW up-grade, directly through PC. 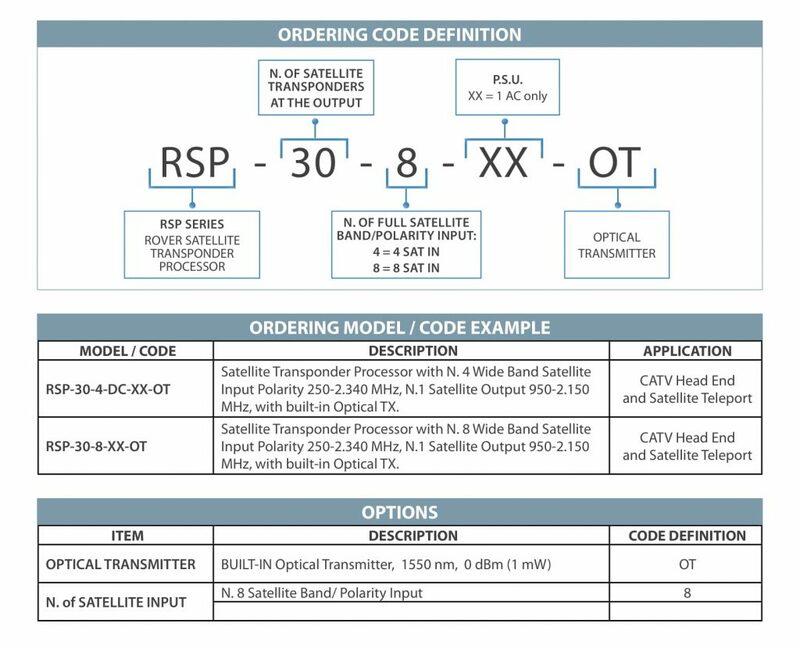 You can select just the requested Transponder frequency (up to N.30 Transponders with 40 MHz bandwidth each), from 4 or 8 Full Extended Satellite Inputs and convert and stack the 30 Transponders into a single Satellite Band. 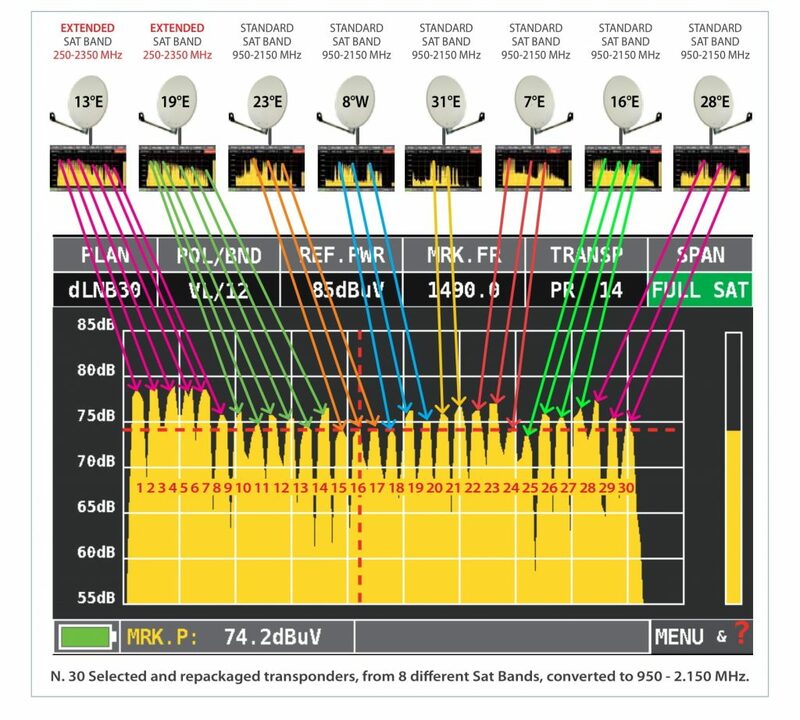 or the NEW EXTENDED SAT BAND from 250 to 2350 MHz that can include full Vertical or full Horizontal Polarity (practically N.1 Band with 60 transponders each instead of the usual N.4 bands with 30 transponders each Satellite). Thanks to the high selectivity and extremely Low Phase Noise, you can select and repackage the desired Sat Transponders in one Standard Satellite band from 950 to 2150 MHz without introducing any interference. HIGH LEVEL SAT RF Output from 950 to 2150 MHz that can drive up to 100 m of coaxial cable with AGC and Slope Control. Optical Output at 1550 nm that can drive up to 10 km of optical fiber.